Since the twentieth century the economic theory has become the domain of abstractions and mathematical models. That development has undoubtedly improved the quality of the economy as a science, but it also hinders the accessibility for (relative) outsiders1. It is not a coincidence that this portal has mainly reviewed books about the political economy, because there the level of abstraction is limited within reasonable boundaries. 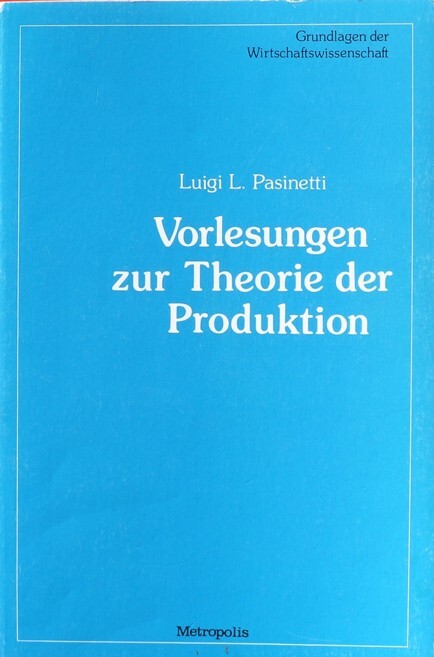 Now an exception is made to this rule by discussing the book Vorlesungen zur Theorie der Produktion by the famous Italian economist Luigi L. Pasinetti. The work is better known under its English title Lectures on the theory of production. There are two reasons to make the exception. Firstly, Pasinetti does abundantly make use of mathematical methods, but he explains these in such a thorough manner, that at least readers with a higher education will not find them too difficult. Secondly, and this is the most important, the contents of Vorlesungen zur Theorie der Produktion has far-reaching consequences for the various branches of economics. Pasinetti elaborates on the neoricardian theory, which has been founded by the economist Piero Sraffa (also an Italian). At the time this theory has shown the objections and deficits for both the common neoclassical theory and the marxist theory. The two famous paradigms both were too pretentious. That insight has drastically changed the economic "landscape". The criticism of Sraffa and Pasinetti with regard to the neoclassical theory (also called the marginalist theory) attacks the aggregation of capital goods into a single value sum. This is an abstraction, which transforms all kinds of equipment into a homogeneous matter. It turns out that this homogeneous capital good is in fact a concept without meaning, because it does not satisfy the normal market behaviour. Besides the criticism on the marxist theory proves the transformation problem in the marxist price-value system. Furthermore the neoricardian paradigm has its own reason for existence, because it is indispensable in the planning of the production within enterprises or perhaps even within a national economy. It has supplied the material intertwined balances and the input-output tables of the famous Russian economist Wassily W. Leontief with a price system. Pasinetti describes all these relations in a masterly way, that is pleasant to read. In the formulas he chooses the matrix notation, which makes them pleasantly transparent. The matrix calculations themselves are explained in a succint but yet complete appendix of the book. The book begins with a nice sketch of the economic history. Next various interwined models are discussed, including the input-output matrix of Leontief. In chapter 4 the material scheme of Leontief is extended by means of a system of product prices. The price calculations are based on the production costs, having regard to a uniform rate of profit or of interest. This is characteristic for capitalism, and explains why the theory of Sraffa never became popular in the former Leninist states2. Then in chapter 5 the real work begins, with a discussion of the neoricardian theory of Sraffa. Here it is also explained how the prices are coupled to the dated quantities of labour. And of course Pasinetti analyses the famous standard system of Sraffa. He adds a number of examples in order to enliven the abstract theory. This chapter 5 contains the criticism of marxism. In chapter 6 the choice of the production technique is explained. There turns out to be a relation between the interest rate and the wage level, which can be expressed in the so-called wage boundary or wage curve. The choice of technique sometimes results in conditions, that are irreconcilable with the neoclassical paradigm (aggregation problem). This becomes especially clear by studying the phenomenon of the reswitching of the technique. As an extra Pasinetti discusses in an appendix of Chapter 6 the relation between the theory of Sraffa and the so-called linear programming. The linear programming is an important operational method for the minimization of the production costs, within the enterprise, but perhaps even in plan-economies. Thanks to a clever structure of the production process it is often possible to economize on the quantities of raw materials and labour3. In chapter 7 Pasinetti shows how the economic growth can be modelled in the neoricardian theory. An appendix of 60 pages treats of the matrix method, including several convenient theorems, such as the one of Perron-Frobenius. It will not come as a surprise that the neoricardian criticism has been ignored by the Leninist dogmatists. It is remarkable that also many westerly adherents of the neoclassical paradigm have tried to simply dismiss the criticism. That does not really strengthen the confidence of your reviewer in the value free science. But the neoclassical thinkers fear that the economical science as a whole will suffer from the criticism. For instance the well-known Dutch economist Jan Pen complains in his boek Macro-economie: "The whole macroeconomics can be discarded. That saves a lot of trouble, but nevertheless does not satisfy us"4. Reversely, the neoricardian discoveries of Sraffa were very popular among the rebellious students of the seventies of the last century5. Since the emotions have calmed down somewhat. In Germany the neoricardian theory is often included in the common text books, such as Volkswirtschaftslehre. In the liberal North-America the situation is more complex. For instance the matter is ignored in the popular text books of the economist Gregory Mankiw. Unfortunately his books are also used in several Dutch universities. It must be admitted, Vorlesungen zur Theorie der Produktion is not a bedside literature. But those who really want to understand the production (marxist, neoclassical, planned, or just in practice) must make the best of a bad job. And here Pasinetti is a welcome and pleasant companion. In spite of the pedagogical talents of Pasinetti the reader may feel tempted to consult others about the same subject. Then perhaps the previous links to the portal may help. If not, then Die Redundanz der Mehrwert-theorie and Grundzüge der neoricardianischen Preis- und Verteilungs-theorie, both by Eberhard Feess-Dörr, and published by Metropolis Verlag, are recommendable supplements.